First things first – congratulations to Mark Deering (Sophia Sachs Butterfly House, right here in St. Louis) and Rod Rood (Washington State University) for correctly identifying yesterday’s “What the heck?” as the cast puparium of an oestrid bot fly. Mark eventually staked his claim on the genus Cuterebra, and Rod as well included this genus in his short list. They are more astute naturalists than I – had I not found the newly emerged adult right next to it, I doubt that I would have known or figured out what it was. Thanks also to the many other people who played the game – most were united in thinking it was some kind of insect, with many noting its distinctly abdominal appearance. It seems, at least among my readers, that shed insect cuticle is a more popular quiz subject than plants. I encountered this individual on open sandy ground while searching for my beloved southeastern Missouri festive tiger beetles. When I first saw the adult, it was on its back on the ground, feebly waving a couple of legs in the air. I at first thought it was some kind of clumsy beetle but realized what it was as I approached it. Clearly the fly was in distress, and I thought it odd that the puparium was laying on the ground next to it. Bot flies in the genus Cuterebra have among the most deliciously gruesome of all insect life histories. The ultra short-lived adults (lacking even functional mouthparts) lay their eggs near rodent and lagomorph burrow entrances, with the different species showing a fair degree of host specificity (Catts 1982). When the fly larva hatches, it migrates to the host and enters the animal’s body through a natural orifice or break in the skin. It then finds a subcutaneous location to feed, creating a cyst-like structure within a swelling of subcutaneous tissue and with a hole at the skin surface to allow respiration. Once mature, the larva exits and drops from the host and burrows into the ground for pupation. We could find no emergence hole nearby, so perhaps the puparium was exposed by rain prior to emerging and suffered some desiccation, or perhaps the adult had gotten stuck in the tough puparium and pulled it to the surface as it emerged – burning its limited energy reserves in the process. At any rate, it is rather unusual to find these things emerging with the pupal case. Cuterebra spp. are known collectively as New World skin bot flies (formerly family Cuterebridae, but now classified as a subfamily of Oestridae). I suspected this was the rabbit bot fly (C. buccata) due to its general appearance – notably the red bands in the eyes, which is a characteristic of rabbit-infesting species. However, the genus is diverse, with 34 recognized North American species – seven of which belong to the rabbit-infesting group (Sabrosky 1986). I don’t have a copy of Sabrosky’s revision, and my efforts to locate it electronically turned up only retail listings for $70 or more. That’s serious coin for someone who really needs to stay focused on his beetles, so I sent these photographs to bot fly specialist Jeff Boettner at the University of Massachusetts. Jeff confirmed that it is indeed a Cuterebra rabbit bot and will confirm a species identity after checking his collection. Speaking of red eyed bots…there is one on Bugguide that a woman from NM posted. It is Cuterebra mirabilis and it may be the rarest photo on BugGuide. It’s only known from 2 previous specimens (also from NM). Its the largest of the rabbit bots. Much darker than yours. Jeff notes that “mirabilis” in Latin means “extraordinary” – a truly appropriate name for this beautiful insect. Even though I am a devout coleopterist, I must confess – cuterebrids rock! This entry was posted in Diptera, Oestridae and tagged bot flies, entomology, flies, immatures, insects, Missouri, nature, parasitism, science. Bookmark the permalink. Excellent Ted. I have learnt something new again. I thought flies came out of small eggs!! That is why I love your blog!! Thanks Joan. I may not have explained things well enough – in fact, flies do come from small eggs. 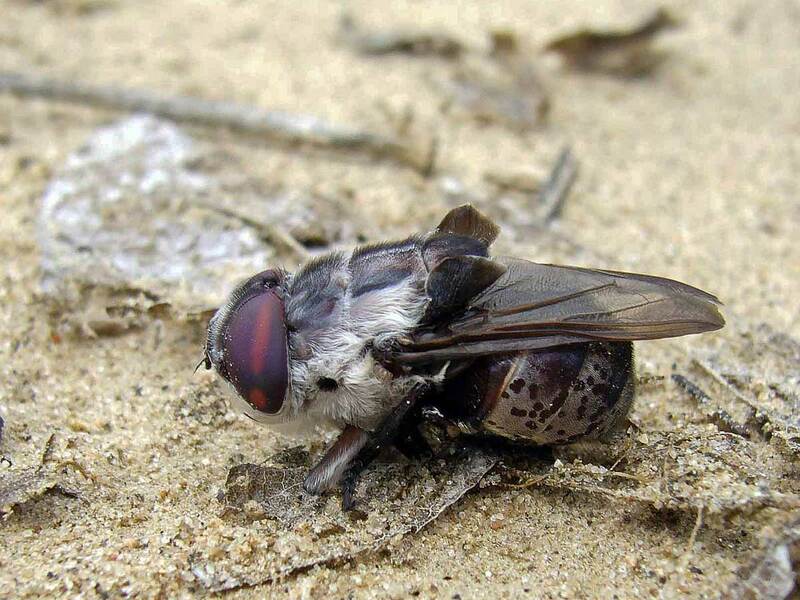 In the case of bot flies, the larvae hatch from small eggs laid in the nest of the host and burrow into the animal to feed and grow (similar to the caterpillar stage of a moth). The ‘puparium’ is a case inside which the larva pupates – much like a caterpillar pupates inside a cocoon. The difference is that a moth’s cocoon is made of silk, while a fly puparium is made from the skin shed during the last larval molt. Eventually, the adult fly emerges inside the puparium and crawls out, much like a moth emerges inside its cocoon before crawling out. I learned a little bit about these nasty critters when I captured an infected kitten, Capone. I wrote about him here http://willowhousechronicles.wordpress.com/2009/03/06/capone/ A later kitten had a much worse infection, including a larva in its nasal cavity. Another good reason to keep cats indoors! 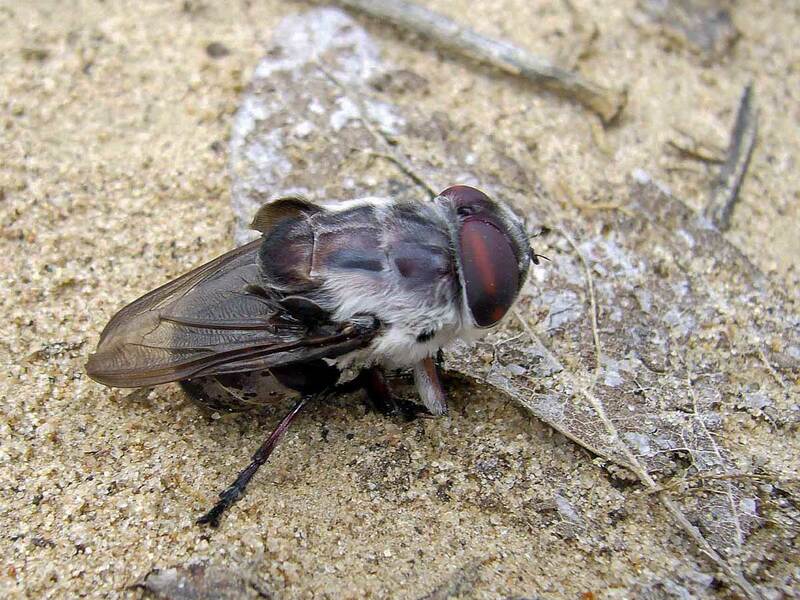 Interesting to learn more about these flies. Thanks! Call me morbid, but I would love the chance to see the larvae of one of these things – just not on a loved pet. Deering is here? Sheesh, there goes the neighborhood. Cool photos. I’m reminded of the time a woman showed up here at the museum with botfly larvae that she had pulled out of herself. Yecch! Okay, that really does make my skin crawl! While living in Brazil a long time ago, I had a human bot fly larva living in my arm for a while. Your puparium looks rather like a mummified version of that critter. Figures, since the puparium is in fact the sclerotized cuticle of the last larval instar! The really revolting part was when I went to a hack Brazilian doctor to get it removed and he screwed up the very minor surgery necessary to do so. I ended up having to finish the job myself, 100 miles from any town, at a little research station out in the middle of the Brazilian Pantanal. But you should have seen the absolutely incredible number and diversity of staphylinids that came to the blacklight that night. Never seen anything that comes even close to that! Our staphylinophilous friend Larry would have been certain he’d gone to heaven, I suspect. I hope you kept the bot fly as a trophy. I got stung by a bullet ant in Ecuador, and even in the throws of pain I found great satisfaction in corraling the little bugger into a killing jar and eventually sticking a pin through his (her) thorax. I was rabbit hunting today, and one of the larva of these guys crawled out of the neck region of the rabbit while i was skinning it. I’m no fan of grubs in general, and I just about jumped outta my skin. John – there is no chance that you became infested. 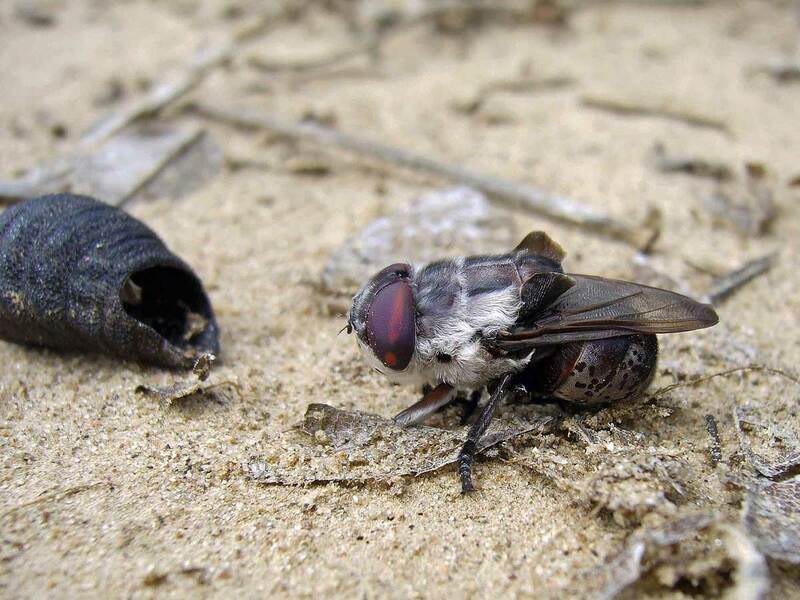 The female flies lay their eggs near the rabbit’s burrow entrance – the maggots hatch, migrate within the burrown onto the host, and find an opening in which to enter the body. No need for you to worry. If you ever see another grub, I’d love to get ahold of one – just boil a cup of water in the microwave, take it out and drop the maggot in the water (which kills it instantly and “fixes” the tissues). You can put the maggot into a little jar of rubbing alcohol and send it to me. Thanks for the insurance, I’d be happy to send you one of the little buggers next time I run into one. We’ve been having a fairly hot and very humid summer this year, and I read that that’s very good for bot flies. I let you know as soon as I see another.